On to Corregidor —Part VIII – Fix Bayonets! Most of the men assigned to Company A ended up fighting the Japanese on their own initiative during the night of 5/6 May 1942. Lieutenant Harris was forced to withdraw from Cavalry Point once Mercurio’s position was overrun. PFC Nixon got into a bayonet dual with one Japanese soldier, and after wounding him, continued moving toward the sound of gunfire. Most of the 1st Battalion, 61st Infantry came ashore within fifteen minutes; within 30 minutes, Japanese infantry were moving toward Marine positions. 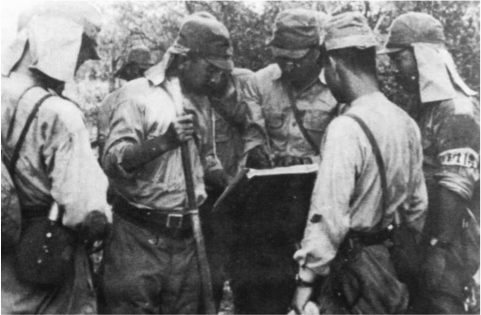 The plan concocted by Colonel Gempachi Sato (pictured right conferring with his staff) seemed to be working, but the 785 men of the reinforced 2nd Battalion were not quite as successful. The current worked against them, and when the landing force neared North Point, where all defensive positions were intact, within ten minutes of the first assault, the Marines were ready and waiting. This fight raged for 35 minutes; Japanese lost 9 of their 10 landing craft. Most of the Japanese officers were killed within a few moments and the soldiers that did make it ashore were trapped behind rocks that were nestled into the beach sand. One machine gunner declared, “It’s like shooting ducks in a rain barrel.” He no doubt experienced adrenalin-induced euphoria. It wouldn’t last. Once the Marines realized the extent of the Japanese Army successes, they initiated a counterattack designed to eject them from the area of Denver Battery. This was the location of the heaviest fighting; it was where Imperial Japanese soldiers came face to face with the American defenders. A few reinforcements did make their way to the frontline of the 4th Marines, but the battle became a duel of obsolete World War I weapons against accurate Japanese knee mortars. The defenders were outmatched. 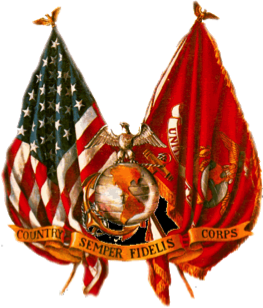 Colonel Howard committed his last reserves at 0430 … some 500 Marines, sailors, and soldiers of a provisional fourth battalion. Movement forward was very costly because Japanese snipers took positions of great advantage to themselves. An additional force of 900 Japanese soldiers arrived at 0530. The Marine regiment was able to hold its position at some locations, while losing ground in others. The Japanese, running short of ammunition, resorted to bayonet charges; the Marines were happy to accommodate them, but any successes were strictly temporary. The battle raged for several hours, a final blow coming around 0930 when three Japanese tanks landed and went into action. The defenders of Denver Battery withdrew to the ruins of a concrete trench just as Japanese artillery delivered a massive barrage. Fearful of the consequences should the Japanese be forced to take the Malinta tunnel, especially owing to the fact that the tunnel contained 1,000 sick and wounded men, and realizing that the defenders outside the tunnel were unable to hold back the Japanese assault for much longer, Lieutenant General Wainwright decided to surrender his men as a means of saving their lives. Colonel Howard dutifully burned the National Ensign and the Battle Color of the 4th Marine Regiment. He then led his men into captivity. In the defense of the Philippine Islands, the 4th Marine Regiment gave up 72 killed in action, 17 who died of wounds, 167 wounded in action, and 474 died in captivity. The regiment would remain decommissioned until 1 February 1944. End of series; next week, a miracle. Kids today say the nuclear bomb is the worst invention ever. We sure haven’t fought a war like this since it was developed though which I consider to be a good thing. I cannot recall his exact words but Einstein said he does not know how World War III will start but that the next war would be fought with sticks and stones. I’m thinking that will be WW4. I think we’ve got one more WMD doozy in us. General Sir John Hackett published a book in 1962 portraying a fictional Third World War between NATO and the Warsaw Pact nations. It was quite well done and entirely feasible. Of course, things do change and there is no longer a Warsaw Pact (Putin may be working on this as I write), but if one were to take Hackett’s scenario and change the players, it could still happen. We have frequently criticized Europeans (notably the French) for their propensity to avoid a fight, particularly when it involves working alongside NATO Alliance partners—with the possible exception of attacking Bedouins armed with antiquated rifles and stones. Although, perhaps the lack of French enthusiasm is a good thing in view of the man Americans placed in charge of the once-greatest nation on Earth. This series was excellent, sir. One sadly gets a clear sense of the destiny of these brave souls who simply did what they were trained for: to fight. I now know a few of their names and honor their faithfulness to country. I was surprised to read the knee mortar was accurate (Is this the mortar with the curved base and fired frag and HE 50mm grenades?). I had always thought it was inaccurate. Apparently, it was deadly. A question: if a Japanese soldier was isolated in monsoon weather without cleaning supplies and even if the inner barrel was chromed in later models, how long before an Arisaka (or any other firearm) would become unusable due to rust and the like? The purpose of chrome-lined barrels was not to make a rifleman’s life in the field easier. It was to extend the life of barrels, particularly in automatic weapons that produced a high rate of fire. Sustained heat has a negative effect on the metal. Barrels that maintain high rates of fire would require changing the barrel out. I’m not sure how often barrel changing was required; I suspect it had to do with the type weapon and circumstances of use. I cannot tell you what the Japanese rifleman did if he ran out of cleaning equipment. American Marines, however, are known for their ability to improvise.